It’s a happy coincidence that New Year’s Eve and the last of the Soul Sunday Sessions for 2017 fall on the same day, so come and join us in seeing the New Year in with a bang at Crusaders with a Summer Vibes themed party featuring a top live Johannesburg act and party music taking us into 2018. The act? Jamie-Lee Sexton. With a fresh and exciting sound that incorporates a little funk, folk, pop and a whole lot of soul, this dynamic musician will blow you away. Expect charismatic energy, unforgettable songs and an undeniable groove. DJ Pedro will then count us down to midnight with all your favourite tracks! The fun starts at 6pm on Sunday, 31 December. The cost for table reservations is R75 per person, payable in advance via EFT or at the bar. This applies to both members and non-members. In other words a table of six will cost R450, which includes champagne, entertainment, décor and a few fun surprises! The kitchen will be open, with pizzas and other meals including the new Galito’s range on sale. Keen yet? If so, please contact Mandy at 031 564 9074 or mandy@c-weed.com to book your table. Tables limited, so get in early to be part of the fun! Two music giants to perform at Crusaders! Legendary country rocker Brian Finch is back in town and will perform at Northwood Crusaders Sports Club on Saturday, 21 October from 6pm. Joining him on stage are long-time collaborators Dan Chiorboli on percussion and Wayne Coughlan on guitar. A Northlands Old Boy, Finch will also be honoured at The Knights Circle of Valour Awards on 24 October, as the recipient of this year’s Music, Arts and Culture Award. These annual awards profile the success of former Beachwood, Northlands and Northwood pupils, who have achieved iconic status in a particular field of expertise. The music kicks off at 6pm. Entrance is free and there is plenty of parking and seating. Also performing at Crusaders this weekend as part of the weekly Soul Sunday Sessions on 22 October is Durban-born producer and songwriter Esjay Jones. Now based in Los Angeles, she is currently in South Africa to join multi-platinum selling band Alien Ant Farm on the first three shows of their upcoming tour. Dubbed the ‘Charlize Theron of rock’, Esjay Jones cemented herself as one of the country’s top female rock vocalists ten years ago, fronting the hugely popular Durban band Stealing Love Jones. Joining her at her free, one-off show at Crusaders are former band members Steve Murray, Andrew Makins, Jason Every and Ant Ellis, as well as a number of surprise guests and LA-based DJ, Shasta. Background music from 12 noon, with the first act up at 1pm. For more information, contact 031 563 0824 or like the Soul Sunday Sessions Facebook page HERE. Not to be missed at the weekly Soul Sunday Sessions at Northwood Crusaders Sports Club on 10 September 2017 is Durban North acoustic duo The Lovemores. A collaboration between Luke Lovemore (a Top 7 finalist on this year’s season of M-Net’s The Voice SA) and his wife Sadie, audiences can expect a fusion of blues, rock and folk, plus more of the distinctive, smoky sound that sets them apart from other live acts. This week also sees eight contestants battling it out in the finals of the Musician’s Gear Zone Acoustic Comp for a chance to walk off with more than R15 000 in prizes, as well as a slot at the annual White Mountain Festival, which is coming up at the end of September. Proving to be a popular way to spend a relaxing afternoon with friends and family, these weekly events are all about good music and fun times at a great local venue. Entrance is free and there is plenty of parking, as well as open and undercover seating if the weather doesn’t play along. Children welcome. Crusaders is at 10 Ranleigh Crescent at the bottom of Swapo Road/Broadway in Durban North. Background music from 12 noon, with the first act up at 1pm. For more information and the weekly artist line-ups, contact 031 563 0824 or like the Soul Sunday Sessions Facebook page HERE. WHAT IS IT? 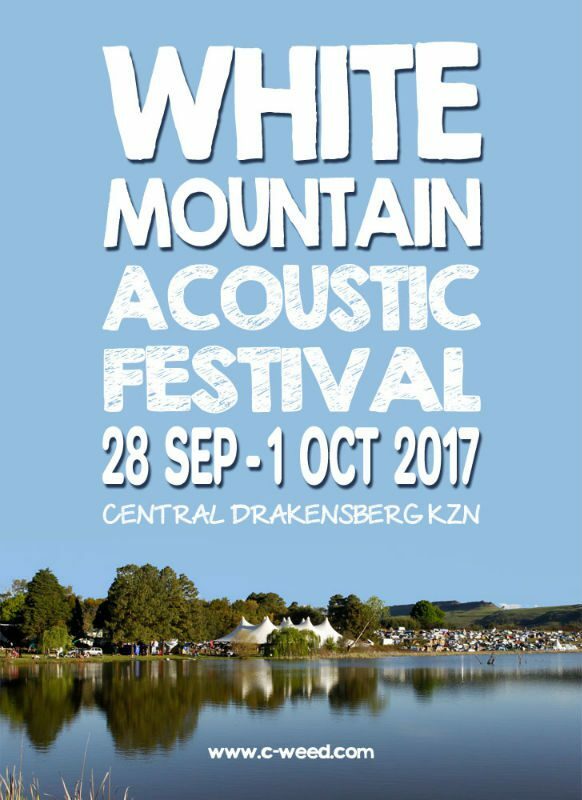 Now in its 12th year, White Mountain is KwaZulu-Natal’s only three-day acoustic music festival and the perfect opportunity to escape the city and unwind in a stunning setting while enjoying a line-up of some of the best acoustic acts in the country, plus so much more! WHEN IS IT? Thursday 28 September to Sunday 1 October. WHERE IS IT? Known for its intimate, relaxed atmosphere, the festival is held at White Mountain Lodge in the foothills of the Giant’s Castle Nature Reserve, only 185km from Durban and just 28km off the N3 on tarred roads. LINE-UP: Performing at White Mountain this year are the likes of Luke Lovemore (Top 7 finalist on this year’s season of The Voice SA), Crimson House, Jenny & The Jameses, The Sextons, Black Whiskey, The Sweet Resistance, Jerry & The Bandits, Bianca Santoro, Luca Hart and Freddy Lalendle, to name a few. ALSO ON OFFER: Colourful arts and crafts, a wide variety of food and drink outlets, plus loads of outdoor activities for the whole family including a 100m zip line and fun stuff (like scavenger hunts) for the kids. And that’s not forgetting the lodge’s spacious grounds, fishable dam, swimming pool and charming old pub (with satellite TV and late-night live music), which add another dimension to the usual festival experience. FREE CAMPING: Situated on terraced ground overlooking the dam, the festival campsite has its own ablution facilities, plenty of space, and is adjacent to the main entertainment area. (No electrical points.) Camping in this area is included in the ticket price. For more information or to make a booking, contact Rush Adventures at 011 963 3049 or email sales@rushadventures.co.za. TICKETS: Advance tickets cost R600 per person at Computicket and include camping for the entire festival. Tickets for children aged 4 – 11 cost R185. Children under four get in free. Expect great music, fun times and smiles all around from this gem of a festival! Aspiring solo musicians stand a chance to win great prizes in the Musician’s Gear Zone Acoustic Comp, which kicks off on 13 August 2017 at Northwood Crusaders Sports Club in Durban North as part of the popular Soul Sunday Sessions. Supported by Musician’s Gear Zone and C-Weed Entertainment Promotions, the aim of this month-long contest is to provide a platform for fresh, up-and-coming talent and hopefully help boost their music careers. The winner will walk off with a Washburn acoustic guitar and music equipment worth R15 000 courtesy of Musician’s Gear Zone, as well as a mainstage slot at this year’s White Mountain Festival, which runs from 28 September to 1 October in the central Drakensberg. Heats will be held every Sunday from 13 August, with the finals taking place on 10 September. Entrants cannot be signed to a record label or already booked to perform at White Mountain 2017. To enter, they need to email their details to whitemountainfestival@gmail.com and supply a link to one original song, plus a link to a video of themselves performing live (amateur footage welcome!). All successful entrants will then need to perform two original songs and one cover (acoustic) on the day of the heat and will be judged on technical ability, vocal ability, song choice, stage presence and crowd response. Each week, two contestants will go through to the finals. Prizes will be presented to the winner at White Mountain; are not transferable and may not be exchanged for cash. The judges’ decision is final and no correspondence will be entered into. 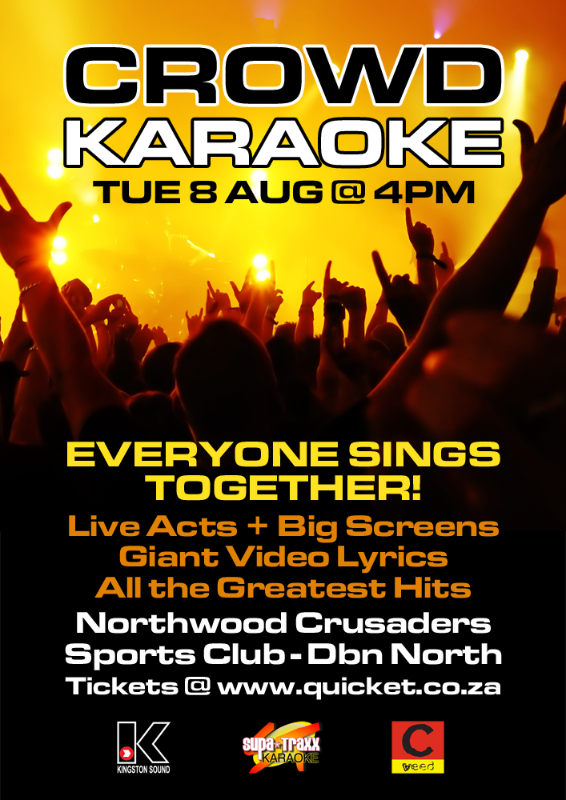 Northwood Crusaders Sports Club is at 10 Ranleigh Crescent at the bottom of Swapo Road/Broadway in Durban North. The competition is open to everyone, provided they can make both the heat and the finals. For more information, contact Pedro at 031 563 0824 or 082 892 6176. Tuesday 8 August sees the launch of Crowd Karaoke, where you and your friends get to sing along to all your favourite songs, with live acts and giant video lyrics to guide you. No need to be shy of being in the karaoke spotlight – everyone sings together and has a blast! So get a crowd together and make a fun night of it. And remember the Wednesday is a public holiday (Women’s Day) so you can really let your hair down! Early Bird tickets (via Quicket) cost R60 and are available until midnight on Monday 7 August. Thereafter tickets will cost R100 at the gate on the day. Gates open at 4pm and the show starts at 6pm. Food and drinks will be on sale and no refreshments may be brought into the venue. All ages welcome. Crusaders is at 10 Ranleigh Crescent at the bottom of Swapo Road/Broadway in Durban North and has plenty of parking. Enquiries: 031 563 0824 or 082 892 6176. For a fun family day out in the country, head to the renowned Nottingham Road Hotel in the heart of the KZN Midlands on Sunday 6 August 2017 for a fantastic line-up of live music featuring acclaimed acoustic duo Qadasi & Maqhinga, ‘human jukebox’ Don Seagreen, as well as Luke Lovemore, a Top 7 finalist on this year’s season of M-Net’s The Voice SA. Dubbed ‘Notties Sunday Live’, these monthly events are the perfect way to spend a long, lazy day with family and friends, while enjoying great music and delicious food in a wonderful garden setting. Children are welcome and there’s ample space for them to play, as well as a jumping castle and jungle gym. Gates open at 10am, with the first act up at 11am. Food and drinks will be on sale and no refreshments may be brought into the venue. Picnic blankets and camping chairs are welcome. Address: R103 Nottingham Road (8km off the N3). For more information, contact 033 266 6151 or 031 563 0824. 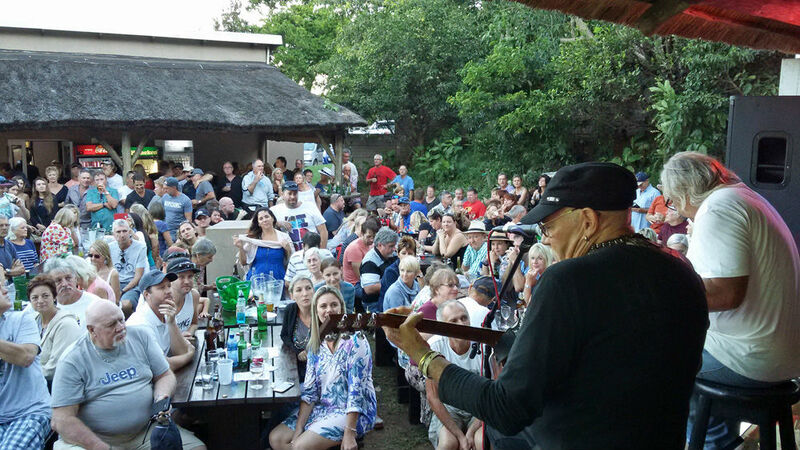 Having played to a packed-out audience at his last Durban show, Brian Finch returns to his hometown again this month for a one-off performance at Northwood Crusaders Sports Club on Friday, 21 July. than 40 years. He will be joined on stage by renowned percussionist and long-time collaborator Dan Chiorboli. Also on the bill is acoustic rock singer-songwriter Roarke Angelbright, as well as James Chandler of The Dead Trends. The music kicks off at 5pm, with Brian Finch up at 8pm. Entrance is free and there is plenty of parking and seating. Crusaders is at 10 Ranleigh Crescent at the bottom of Swapo Road/Broadway in Durban North. For more information contact 031 563 0824. The legendary Brian Finch wowed fans at Crusaders in April this year and will return for a one-off show on Friday, 21 July. Entrance is free so get there early! After a hugely successful debut event, Notties Sunday Live is back on 2 July 2017 with another top-notch line-up of live music featuring SA music great Pierre de Charmoy, smooth-voiced crooner Dave Starke and Kéch Sánchez, frontman for popular Howick band Pan Latino. Held at the legendary Nottingham Road Hotel in the heart of the KZN Midlands, expect a fun day out for the whole family, with a relaxed, friendly vibe, great music and delicious food in a wonderful garden setting. What more could you ask for? The hotel is situated just 8km off the N3 on the R103 in Nottingham Road. For accommodation bookings or to reserve a table in the à la carte restaurant, email reservations@nottieshotel.co.za or foss@tiscali.co.za or call 033 266 6151. For general information, contact 031 563 0824. You can also keep up to date on the monthly line-ups by liking the Notties Sunday Live Facebook page here. Please note: Advance ticket sales close at midnight on Saturday 1 July, after which tickets will only be available at the gate on the day.